You may have heard that Japanese cities are legendarily picky about garbage sorting and collection. Unfortunately, this pickiness extends all the way to consumer electronics, some of which are especially difficult and expensive to dispose of. Let's take a look at how to get rid of some of you old, broken appliances. Figuring out what category your soon-to-be-disposed of electronic device falls under can be tricky. What is worse, the rules for disposing of electronics often differ by municipality and prefecture. Note that the above mentioned categories apply to home use items only. If you run a business then you have to contact a disposal professional on your own. Check out the Home Electronics Association's recycling website or the Ministry of Trade, Industry, and Economy's recycling site for more details. Home computers and monitors, on the other hand, fall under a different category and must be disposed through the original manufacturer with the help of the PC Recycling Promotion Association (see our up coming article for details). Other non-designated and non-hazardous electronic garbage should be handled by your town. Check with your local city hall, ward office, or local government to see what exactly the rules are for miscellaneous junk. Rules can differ significantly from town to town so make sure you inquire as to how and where electronics can be safely disposed of. Don't be "that guy." Recycle! 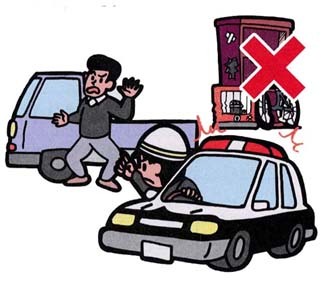 And don't forget, illegal dumping (fuho toki 不法投棄) is not taken lightly in Japan. Regulations for illegal dumping vary by the severity and type of material dumped, but the strictest dumping regulations carry a 5 year prison sentence and a 10,000,000 yen fine. This is on top of any other fines and criminal punishments designated by your town or prefecture. This only applies if you buy a new appliance directly from a brick-and-mortar retailer. According to recycling law, retailers are obligated to pick up old specially designated electronics once you buy a new one. However, they rarely do this for free. If you buy a new designated electronic device from Super Electronic Shop Gundam, then you will often be asked if you want an old device collected (kaishu 回収). The cost of collecting varies wildly by retailer and by area. Some big retailers offer a discounted collection while others charge for collection plus the cost of dispatching a team to pick up your old electronics. To make matters worse, some retailers will only offer discounts on relatively new collectible goods. Others will charge you extra if you live above street level. If you bring the device in by yourself, many retailers will give you a discount or waive the transport fee. In smaller cities, some big retailers allow you to rent small trucks for free for about an hour, which is usually enough to get to your place and back provided you have the manpower to lift a relatively heavy piece of equipment. This is where it gets really tricky. If you want to get rid of an old electronic device and you don't have a brick-and-mortar retailer to go to then you have to pay the fee and arrange transport yourself. The first step of the process is to figure out who manufactures your appliance, what model it is, and how big it is. The recycling fee is set by individual manufacturers working through an industry association so the price is in no way uniform across a product category. The Home Electronics Association keeps a list on on its website that can be searched by katakana name, English lettering, and by maker logo. Next, you must get the recycling ticket (risaikuru リサイクル券) at your local post office bank (Yucho Bank). This is the worst part because Yucho Bank is only open on weekdays from 9:00AM-3:00PM. This is all good if you are unemployed but if you happen to have a job then you had best start saving up vacation days. This whole process cannot be done online, unfortunately. After you ask for your recycle ticket, the post office staff will generally consult their big book of recycling information to make sure the fees are all in order. You will then have to write down your name and address before being sent off to pay. 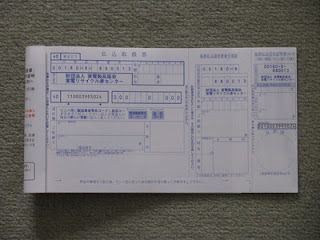 If you pay the recycling fee at the teller window it will cost an additional 120 yen. However, if you pay at the ATM then it will only cost 80 yen. The Home Electronics Association has a handy flash movie here for those of you who can read basic Japanese. Finally, you have to arrange for collection of the device or bring it in yourself. Some towns offer a service where the local garbage collection centre will dispatch a truck to pick up your discarded device. This service, of course, is rarely free. However, many smaller towns require that you haul your own garbage. Collection points may be centralised or they may be divided according to device and manufacturer. Contact your city, town or ward's environmental division (kankyo-ka 環境課) for details about how to dispose of designated electronics. Rules for non specially designated garbage differ wildly from town to town and prefecture to prefecture. If you are moving to a new area, stop by your local village, town, or ward office. Often times they have handy garbage sorting charts in multiple languages. Most areas still have special days for "large garbage" (sodai gomi 粗大ごみ) which often includes non-special designated electronics. Again, talk to you local municipal office about the specifics of large garbage collection. Finally, you may have heard the loud speakers of trucks that drive around advertising garbage pickup and disposal. Flagging down one of these trucks will drastically simplify your electronics disposal but keep in mind that they won't take your garbage away for free. Drivers typically charge a convenience fee on top of the price of recycling the electronics.